This is the first article of a trilogy on the role of open organizations in military R & D, considered in particular from the point of view of stealth and radar technologies. Military rivalry is a crucial factor in scientific and technological progress. Scientific and technological progress from the military field also affects civilian life. A good example of this is the Internet, which comes as the result of more than two decades of military technology programs. Military rivalry varies in intensity over time. Periods of relative relaxation alternate with peaks of tension. In terms of military technological innovation, the maximum of rivalry during the post-war period was reached in 1957, in the context of the race for space. The race for space wasn’t placed directly under the sign of military confrontation. However, it provided the privileged terrain of the rivalry between two geopolitical blocks ; and the progress achieved in propulsion had a direct impact on performance gains of nuclear missiles. The Americans emerged victorious from this duel with the Apollo 11 flight in 1969. What triggered the duel is of course the launch of the Sputnik satellite by the Russians in 1957, which revealed the fact American rocket technology was lagging behind Russian rocket technology. Under the authority of Stalin, the Russians had, from the beginning of the post-war period, intensified and concentrated their efforts on missile propulsion in the greatest secrecy. Sputnik triggered a shock among Americans, until then largely uninterested in the conquest of space. Suddenly, the objective became to launch manned flights, and even to put a man on the moon. On the organizational front, President Eisenhower and his advisers saw the need to organize the proliferating mass of programs launched in response to the new space challenge. In February 1958, Eisenhower ordered Secretary McElroy to establish a super agency to coordinate all of the Pentagon’s space projects: the Advanced Research Projects Agency (ARPA), later to become DARPA. The new super-agency did not seem to have much influence at first. However, it is at the origin of both the Internet and the Saturn V rocket that allowed Americans to win the space race in 1969. In a seminal article on open organization, Albert Meige refers to DARPA as a model for the mobilization of on-demand talents on the basis of concrete and inspiring breakthrough projects, particularly in the form of challenges and competitions. — Outdoor open competitions that work as an accelerator and as an attractor and multiplier of resources. — Freedom, minimizing bureaucratic weight for researchers and projects. — Very high: breakthrough technology, competition, defense of the free world. DARPA is not without historical precedent. Its model arose from the realization that in the twentieth Century, technological innovation has become a factor that can, on its own, weigh decisively on the outcome of a military clash. During the Second World War world, the radar played just such a decisive role. Mobilizing scientific and technological networks through concrete challenges was used with the MIT Radiation Laboratory as well as in Los Alamos in the context of the development of the atomic bomb, another decisive military technology. This episode reveals the real meaning of having an open platform. A platform exists to attract the best talents. The scientists who created the atomic bomb were all or almost all from the Germanic world, but they put their talent in the service of the USA. From the outset, it is clear that the notion of openness has little relation to that of transparency, which is something quite separate. The publicity of certain current challenges does not contradict the secrecy of projects. Most of what DARPA does is wrapped in a thick veil of secrecy. DARPA adds an institutional interface to the model of Rad Lab and Los Alamos. This interface allows to efficiently connect both individuals and institutions. It constitutes the point of origin of the Internet, which as a digital tool promotes the organizational principle of the project adhoc-cracy. Temporary project groups have their member reassigned to work on other projects at the end of a project. In this type of organization, the project manager and the project specifications play a key role. The development of radar stealth technologies is the result of DARPA programs that launched in 1958. The 1970s saw R&D on stealth take a direction that would eventually lead to the stealth aircraft we are familiar with today (F-118, B-2, F-22, F-35) … a direction that owes everything to the American openness to ideas of a… Russian researcher. The basics of radar stealth were indeed laid out in Russia by Petr Ufimtsev. Russian authorities, judging that Ufimtsev’s research was of no military interest, allowed the publication of his work, which the men of DARPA eagerly translated into English. Stealth, unlike space rockets, is essentially not a dual technology, it is fundamentally a military technology. Civilian aircraft have an interest in being easy to spot. The cost of developing stealth technology is high. Following the collapse of the USSR, the American advance in the field of stealth, obtained after decades of intense efforts, lead to a situation of lasting superiority. Putting in a big effort ceased to be a necessity. The 1990s were period of relaxation of military rivalry. Military technological innovation ceased to be a priority with the collapse of the USSR. This situation that has encouraged certain tenacious illusions… Until 2014, the idea of a post-historic, even post-heroic mode of existence of humanity still pervaded Western consciousnesses. This idea has its origin in the collapse of the USSR in 1991 … and finds its refutation in the uncertainties of the current global environment. In terms of organizational dynamics, periods of relaxation favor bureaucratic tendencies, in the bad sense of the word: dilution of responsibilities, inertia, slowness, excessive size and unmanageable organizations. Theses attributes may be viewed as the result of survival strategies in times of budget constraints. These tendencies also affect military technological innovation. In the case of the United States, during the 1992-2014 period the Pentagon decided to rest on its past laurels. Gradually, the force multiplier achieved by past investments in technology, eroded. During this period, the Pentagon largely withdrew from a large number of scientific fields. Towards the end of the Cold War, under the Reagan presidency, the Defense Intelligence Agency and the CIA set up the Socrates Project, with the mission to provide keys to understanding the loss of economic and technological competitiveness of the United States, and to formulate industrial policies capable of correcting this problem. However, the Berlin Wall collapsed just as this project was about to deliver its results. Ideologically opposed to any sort of industrial policy, President Bush (senior) systematically ordered every trace of this project to be eliminated. With the end of the Cold War, the Pentagon stopped worrying about buying American products, citing the need to reduce costs and not limit options to potentially sub-par local solutions. The result of this policy change is that the United States became unable to fly its military aircraft without using parts made by potential adversaries. This situation has since the beginning been viewed negatively by the army. However, the power of influence of manufacturers was successfully used to enable highly profitable outsourcing programs. 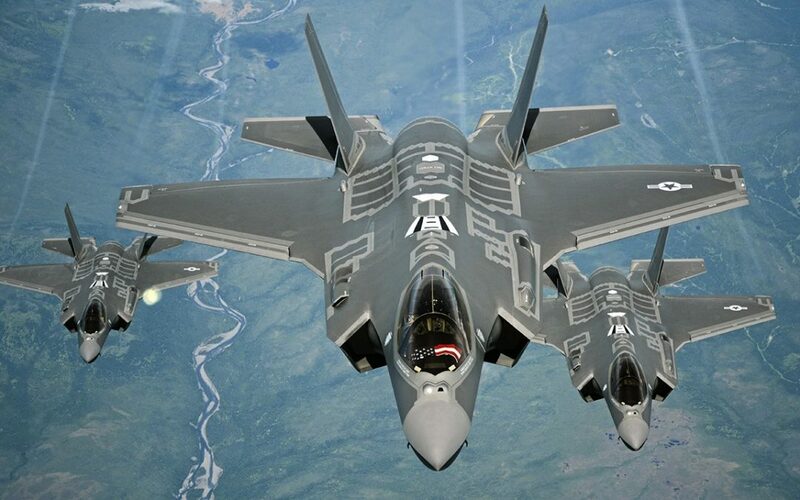 A single program symbolizes the tendencies described above: the F-35 program, named after the fifth generation multi-role aircraft designed by the Pentagon and developed since 1996 by the manufacturer Lockheed Martin, with the help of Northrop Grumman and BAE Systems. Here are a few relevant facts: the program was launched in 1992, the first flight took place in 2006 (F-35-A), the full production was entered, after years of delay, in 2018. The cost of the development of this aircraft exceeds a trillion dollars. Lockheed Martin is a giant in every US state, resulting in a strong lobbying capacity, which no doubt explains the preservation of a costly program over the long term, regardless of reductions in military budgets. The basic problem of this program is visible in the constitution of its specifications: the Navy required landing on aircraft carriers, the Air Force wanted fast planes capable of dominating duels, the Marines demanded vertical takeoff, and Congress wanted a plane capable of doing all these things. Without trying to judge the strategic merit of the F-35 design, it seems clear to us that the existence of a program of this nature would be unlikely in a context of high military tension. The performances of the F-35 are in any case a subject of debate today. Only actual combat results will be able to settle this debate. One of the major question marks concerns the stealth capacity of the F-35. Enemy target detection and acquisition capabilities have evolved, potentially going as far as neutralizing the advantage of stealth. Industrial espionage, as well as the loss of an F-118 in Serbia in the late 1990s, allowed Russia and China to gain a better understanding of the technologies used by the Americans. 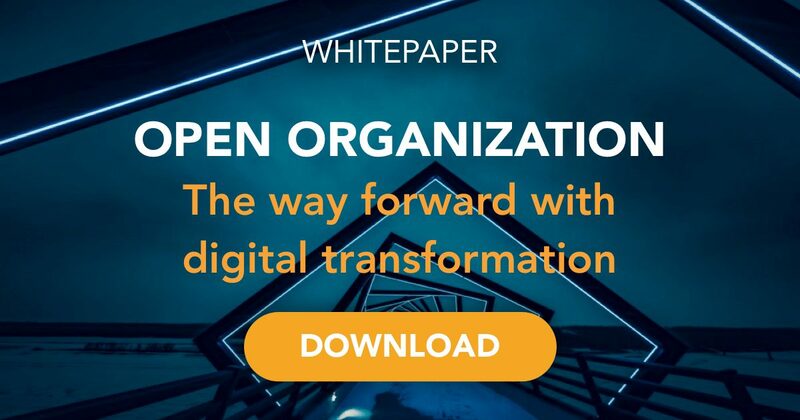 In addition to this, the digital transformation has greatly increased information processing capabilities, favoring improved performance of target detection and acquisition systems. Currently, we are rapidly exiting the 1992-2014 sequence. But this change did not happen suddenly. The real inflection point is in 2008. It is this moment that makes it possible to better understand our current upheavals. In the United States, the socio-economic suffering caused by the 2008 economic crisis has inexorably fueled a desire for protection and isolation among certain segments of the population. The coming to power of Donald Trump and his policy of trade war suggest that the period that is opening now sees and will continue to see a refocusing of the USA on internal problems. At the same time, the return of Russia and the rise of China have lead the United States to put in place a strategy to maintain their position of technological and military superiority, if necessary by throwing a spanner in the works of competing powers. In this context, it is interesting to note that the success of DARPA has become a myth of sorts, an absolute benchmark in terms of technological innovation. This includes Russia, which has recovered from its weakness, and is now determined to make use of its geopolitical weight. In 2012, Russia created the Foundation for Advanced Research Projects of the Defense Industry (site: fpi.gov.ru), which presents itself as an organization operating on the same principle as DARPA. This decision was motivated by the desire to close the gap in advanced research with Western partners after more than twenty years of stagnation of the Russian military industry. The long-term goal of this organization is to provide the basis for the national weapon system for the period 2025-2030, by developing key elements of next-generation military weapons and equipment. Its mode of operation is based on projects and challenges in a wide variety of fields. One of the mysteries of Russia, from the Western point of view, lies in the disproportion between its geopolitical and military weight and its economic wealth. Most notably Russian GDP is below Italy’s. This disproportion is not new, however. It has already led Russia to surprise its opponents in the past. The Germans were surprised by the superiority of the T-34 tank during the Second World War. The Americans were surprised by Sputnik, and again surprised by the return to might in recent years. 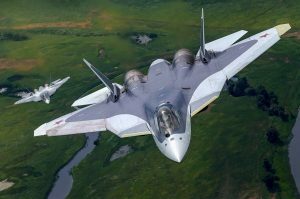 A return to might that manifests itself in terms of technology, including through the development of new generation fighter aircraft, such as the SU-57, intended to go into production in 2019. The Foundation for Advanced Defense Research Projects has a budget of 61 million euros, compared to the 3 billion dollars managed by DARPA. Russian past performance in military technology, however, should not lead to an overestimation of what Russia is able to achieve today. Russia needs foreign buyers to be able reach an economically viable scale of production … the recent Indian dismissal of the Su-57, due to insufficient stealth capacities, suggests that even for Russia, the economic obstacle remains quite real. Note that the Russians seem to have deliberately opted with the Su-57 for a relatively low-stealth aircraft. The lack of economic resources may have encouraged them to explore original tactical avenues, rather than trying to emulate the American design. It also seems likely that the Russians take very seriously the potential for improving the performance of radars brought by the digital transformation, especially through artificial intelligence. Will Russians imitate the agile organizational methods developed in the West? Or will they follow another approach? Our current level of information does not allow us to directly apply the analytical key of open organizations to the Foundation for Advanced Defense Research Projects. However, it is possible to note from the outside that one of the main differences brought by the Russians lies in the content of the inspiring mission of their open organization, based on the idea of a multipolar world, in other words of a world divided into distinct zones, limiting the field of intervention of the great powers. The question then is what inspiring mission is, in fact, the most inspiring, that is, the most attractive of and for key talents. We have seen that at every stage of the recent history of military technological innovation, the factor of openness to external talent has played a key role. The soft power of openness of organizations is destined to play a crucial role in a world of new conflicts. It should be noted that the inspiring mission is all the more important because of the weak demographic dynamics of all developed countries, a situation that in fact creates a situation of global hunt for technological talents. One thing is certain: better piloting, funding and efficient advancement of military technological innovation are now becoming a top priority for States. Les Russes et les Chinois sont effectivement à la traîne de la furtivité américaine, et de la France également, mais ont choisi de “décrédibiliser” la furtivité d’avions de 5ème génération en développant la détection (radar), le durcissement d’objectifs (bulles A2-AD), et la réaction (missiles sol/mer/air-air hyper-véloces). Les technologies d’intelligence artificielle apportées à la détection radar et au temps de traitement des informations qui en découlent sont également prises en compte par la France, le Royaume-Uni, la Russie et la Chine. Ainsi que l’accès aux matières premières et aux technologies de transformation. Les budgets qui en découlent sont avant tout une question de volonté politique, et la manifestation d’une souveraineté et d’indépendance.